Is anybody out there still paying attention to the deluge of political ads running hot and heavy on the TV news? I usually start the news 10 minute late so I can TiVo through the ads, and I go through stretches blissfully free of the political noise. The ones I need to know about for news purposes, like the Karl Rove spot I wrote about the other day, always find their way to my e-mail inbox. But sometimes like last night, I feel a need to experience the full gamut and let the news run with my finger off the fast-forward button. The negativity isn’t as bad as I’ve seen in other states, but the endless petty carping by candidates and their third-party supporters casts a pissy tone on the campaign, leaving an unpleasant taste with viewers who see the attackers looking as bad as the attackees. It breeds disrespect for both the candidates and the system, and I’m beginning to understand why so many see it all as pointless and just tune it out and don’t vote. The rat-a-tat repitition of the same spots for weeks tends to grate on the viewer, as does the proliferation of similar ads from different sources. A Charles Djou ad attacking Colleen Hanabusa for supporting the 36-percent legislative pay raise loses impact when it’s immediately followed by a Republican Congressional Campaign Committee spot making the same point. President Barack Obama’s ad saying he needs Hanabusa in his corner doesn’t look so special when it’s followed a minute later by an almost identical spot saying he needs Neil Abercrombie. I voted absentee the day the ballots came out and don’t feel I missed a shred of useful information by sparing myself the final two weeks of this noise. It gives me time to ponder the sobering thought that the special interests who put up the dough for the grossly expensive onslaught will expect to be paid off by the winning candidates with public favors. OK, if I’m going to grumble about ads I don’t like, I should point out one I do. 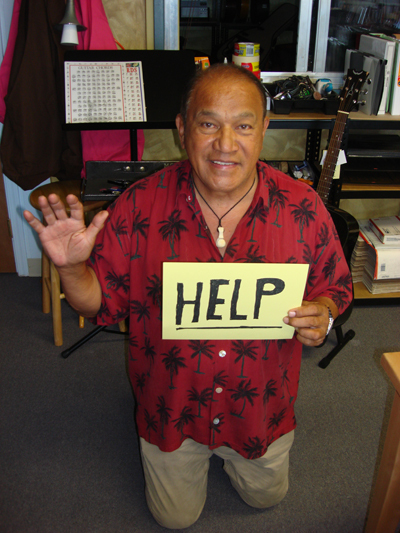 This spot — entitled “On my knees!” — was sent in an e-mail to supporters by OHA candidate Peter Apo, musician, community activist, former legislator and all-around good guy. Brilliant combination of social media and sign-waving. This entry was posted on October 22, 2010 at 12:09 am and is filed under Volcanic Ash. You can subscribe via RSS 2.0 feed to this post's comments. Lament all you want and call it noise, petty and pissy but the reason why it’s like this is simple: it works. I hope youre wrong, Charles. I think the Hanabusa commercials, in particular, are the most cocky, obnoxious, and mean of them all. Who wrote those? Who decided to post (illegally) the most unflattering pictures of her they could find? Answer: a bunch of immature little boys – because real men wouldnt be that disrespectful and mean-spirited to any woman. hipoli, I’m certainly against negative campaigning, and I agree with you that the GOP hit pieces are terrible, but I really don’t think you can pull the gender card here. If Hanabusa (and all women) expect to be taken seriously, there can’t be a double standard for treatment. Does this mean the commercial are for Hannabusa or against her? I believe that there is no one claiming title to producing this commercial and could be either male or female, since women are in advertising as well as men. Seems also that these commercials were made on the Mainland by either Mainland Democrats for or against or Mainland Republcians also for or against. Not, Made in Hawaii. Politicians now “Cat fights”. One using a “vipers tongue”. One debates like a girl. Men would rather go 3 rounds and “Duke” it out. John Prine puts out great stuff. Awoman! to that Dave! I voted absentee and so glad I did. Is this the same Peter Apo mentioned in the recent Honolulu Weekly cover story?